Argh! Yet another locked gate. I try hard not to trespass, so this is the end of the road for me. 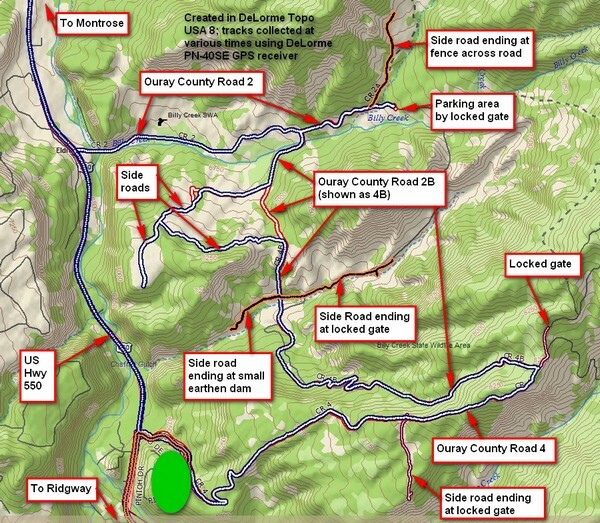 This evening I went for a nice ride (see here for pictures) and along the way mapped out what I think are the last side roads available from Ouray County Roads 2 and 4. As you can see from the GPS track (below), there are lots of them. Actually, there are more, but the others are marked as “Service Road, Do Not Enter” or some such, and I make it a practice to obey these signs. I added a couple new side roads: they’re the orange tracks on the GPS track collection below. Hopefully this is now pretty complete. One can spend lots of time in here and the scenery, while not high country, is certainly beautiful. Here's the sum of many GPS tracks all collected in one place for the complex formed by Ouray County Roads 2 and 4. For previous descriptions of County Roads 2 and 4, see here (video) and here (side road off CR 4) and here (more side roads) and here (the horse video). Dave, Thanks for teaching me about GPS Tracks – as a result I just found and downloaded My Tracks to my Android phone! In England, when someone finds what’s supposed to be a public path or road that has been unofficially blocked off, people ignore the blocking device.